The final three players came to an agreement to chop up the remaining prize pool money. Gene Santora is officially the champion of the $300 Mega Stack Challenge and takes home the trophy as well as $44,264. The board ran out [Js][8h][6d][Td][7s] and Santora won the pot to eliminate Bendkis in 4th place for $25,000. The final four players in the $300 Mega Stack Challenge have come to an agreement on a deal. New payouts are as follows with the eventual winner getting another $10,787. The board came [9d][8c][8h][6s][6h] and Santora's kings held to win the pot. Stan Lee was eliminated from the $300 Mega Stack in 5th place for $13,029. The board came [As][7c][2c][8c][Td] and despite making two pair, Joseph was eliminated by Millea's trip aces. Jackie Joseph takes home $10,348 for his 6th place finish. The board came [Qh][4d][3c][6c][Kd] and Santora took the pot to eliminated Lopez in 7th place for $7,775. The board ran out [Js][Tc][4d][9h][7c] and Lee's ace high held up to take the pot. Joshua Kronick was eliminated in 8th place for $5,898. Stanley Lee raised from under the gun to 330,000 with the blinds at 80,000-160,000 with a 20,000 ante. David Luty moved all-in from the small blind for about one million and Lee immediately announced call. The board came [Qd][Ts][7s][Qc][9h] and Lee's aces held. David Luty was eliminated from the $300 Mega Stack in 9th place for $4,742. The board came [As][8c][7c][Ac][Kc] and Patel made a flush on the river. However, Santora made a better flush to win the pot. Raj Patel was eliminated in 10th place and takes home $2,761. We had a total of 182 players in today's $500 NLHE Bounty Deep Stack event. We are down to the final 20 players in the $300 Mega Stack Challenge event. The blinds are currently 20,000-40,000 with a 5,000. The average chip stack is just over 797,000. $300 Mega Stack Day 2 Underway! Day 2 of the $300 Mega Stack Challenge event is back underway. The blinds are starting at 12,000-24,000 with a 4,000 ante. With 39 players remaining, the average chip stack is just under 409,000. 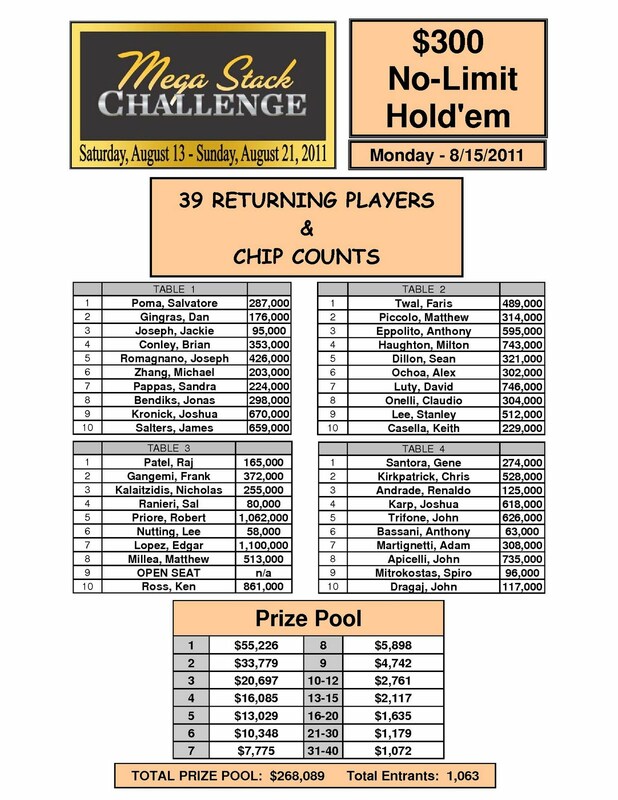 Play has come to an end on Day 1 of the $300 Mega Stack Challenge with 39 players remaining. Play will resume at noon tomorrow and will continue until we have a winner. Stay tuned to www. FoxwoodsPoker.com for all of the updates from the final day of action in the $300 Mega Stack event.